In a moment, everything can change. Your worries. Your priorities. Your prayers. Today you get to hear from the heart of a mom who experienced just this. Veronica Janus was born and raised in Sweden but currently lives in Chicago with her husband and three children. Her life took a major turn when her son was born with major health issues. Today she shares with us a little glimpse of what she learned through this experience. She has written a beautiful book called Abundantly More –a Mother Clings to God as her Baby clings to Life. The holidays are usually a time when we are more eager to give and help those in need, especially basic needs of food, clothing and shelter. We donate winter coats and we volunteer in soup kitchens. But what about those who have everything they need and are suddenly thrown a curve ball and end up in the hospital. What do we give them? How can we help? Pray in solitude at home. Pray with your family, friends, small groups. Place the patient and their family on a prayer list at your church and other churches. Leave a prayer voicemail for your friend. Send them an email prayer. Quote scripture. Let them know you and others are praying for them. If you get them live, pray with them and you do all the praying. They’re exhausted. If they don’t want prayer, pray for them alone. Be a sounding board. Don’t talk about yourself or your problems. If you have gone through something similar it’s ok to share but keep it brief and positive. Don’t tell them you understand or you know how they feel, because you don’t. Instead mention how this must be very hard and ask how you can help. Give a few concrete examples of help so they don’t have to think. Set up a meal plan for the family through email, www.evite.com, or www.mealtrain.com. Place a cooler on the family’s porch where people can easily drop off food. The family may not be home a lot. Bring food to the hospital giving the family a break from cafeteria food, fast food, or skipped meals. Provide child care at the hospital in designated play area (so children are close to parents), in your home or the family’s home. Set up carpooling for children and adults. Offer to set up play dates, take children to birthday parties and other events around the holidays to keep normalcy for children. Offer to purchase Christmas gifts for the children in the family. Set up regular home management like snow shoveling, lawn mowing, raking leaves, house cleaning, laundry, dry cleaning, oil changes, car washes, and decorating the home for the holidays. Be a liaison between the patient and family and the outside world. Setting up an update and communication system is vital but may take away precious time from the family or patient on a daily basis. There are special health sites such as www.caringbridge.org, www.carepages.com but Facebook and regular email work too. Send cards, flowers, gift cards, stuffed animals, books, toys directly to the hospital room or the family’s home to brighten up their environment. Call the hospital in advance to ask what is allowed in patient’s room. The main point to remember is that a hospital environment is a very intense and busy place. Patients and their families are inundated with medical information and multiple doctors visiting daily. There is little time and room to think about anything but the patient’s health and advocating for them, especially if they are admitted long term. 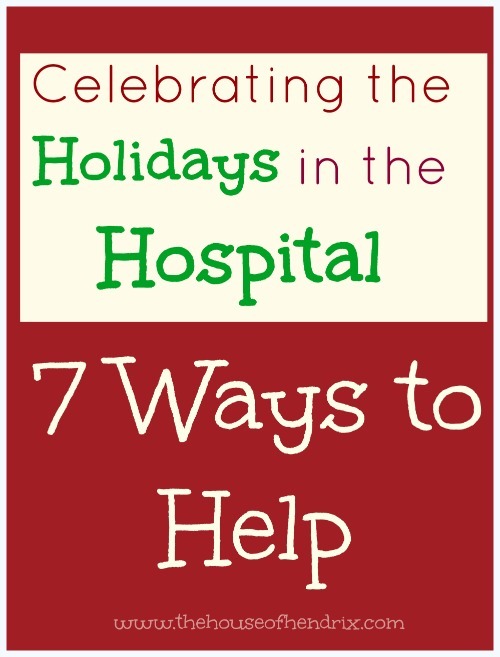 How have you experienced the holidays in a hospital? Leave a comment below and share your insights with us. 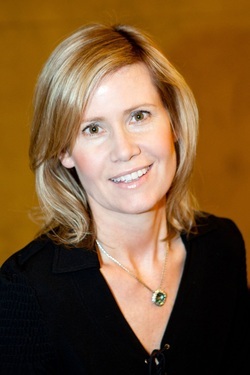 Veronica Janus is a writer and speaker. Her book, Abundantly More, a spiritual and medical journey can be found at major bookstores. She lives in Chicago with her husband and three children. For more information please visit www.veronicajanus.com. You can also follow her on Facebook. This entry was posted in Christmas, holidays, NrelateShare and tagged Christmas. Bookmark the permalink. Our daughter was born eight weeks early and on the Monday before Thanksgiving. I found being in the hospital painfully lonely on Thanksgiving never mind all the stress of a preemie in the NICU. My hospital door was more like a revolving door the first few days but actually on Thanksgiving, the only ones who came were my husband (with a turkey dinner for both us – he rocks!!) and my mom. The calls ceased as well. That was eight years ago and I have vowed to be acutely aware of loved ones in a similar situation. Thanks for sharing kim. I tthink those who have lived through it have the greatest insight. Your sensitivity is going to be such a be such a blessing to so many. Hope you have a blessed thanksgiving. These are such helpful practical ways to help. Thanks you. When my mom was in the hospital, people didn’t know what to do. It was ackWard. These are great. My husband was in the hospital for 7 months. God showed up bunt nobody else. This is refreshing. Buying Veronica’s book now. I was in the hospital and people did exactly what you said. They over shared their experiences and said they understood. They didn’t. It frustrated me. Everybody should read this. I too am buying this book. Veronica, how did you handle thank you notes and thanking folks for thoughtful gestures! Is it ok to assume they know your heart? My friend won’t accept help as she sits by her husbands hospital bed for the past few months. I want to respect her wishes but also know she has obvious needs nit being met. Any suggestions if I should organize without asking? These are some great ideas! We had to be in the hospital with our youngest, but not over the holidays. However, as a family, we bring meals to the Ronald McDonald House that is IN the hospital-serving any of the families who want to partake that have kids in the hospital on that day on Christmas Eve. It is a wonderful way to help those families who may not have anyone doing anything like this for them. We love it and enjoy showing God’s love to them! You are so right that they just need someone to listen.. and sometimes they need someone to talk to about something OTHER than what’s going on upstairs.. and sometimes, they just need food and quiet. It all depends. Having our kids there has been a blessing, too. They play with the siblings who are there, but have had no one to play with for however many days. It is a wonderful experience that stretches us in more ways than we know. I spent a Christmas and New Year’s in the hospital on bedrest while pregnant with my youngest. A total of five weeks. My favorite things were the “Christmas Tree” my husband made for me, a large photo of our tree at home on foam core with lights poked through and the other favorite was a large board full of all the holiday cards that came in, pictures that made me smile, and paintings from my oldest (who was only 2 1/2) at the time. I used that board to cover the awful discharge times for patients sign that was just a cruel joke. After the first two weeks no one sent flowers anymore and it would have been lovely to have some after the first ones were wilted. The other big things were having my own pajamas/ clothes since I didn’t need to be in a hospital gown, and my own sheets on the bed. Thanks for sharing about your 5 weeks in the hospital. What a great reminder to me to keep showing up and loving on families after the initial 2 weeks…when the weariness kicks in on a new level. You have great insight and will certainly be a huge help to your friends who find themselves in that situation. Thanks again. This article is great – we spent Christmas and New Year’s at the hospital and the Ronald McDonald house in 2010 while our son was in the NICU (6 week stay). It’s depressing to go at the beginning of the holiday season, and then see maintenance taking down the decorations. The food idea is great – it definitely gets old with only a few options. Not many visited because they just couldn’t handle it, but the best ones were the ones who listened and let you cry. Also the ones who could make us laugh. K Drake’s comment about the meals at the Ronald McDonald house are soo true! We would stay at the NICU until around 10 – 11ish at night, and when we got back to the house, we could heat up whatever people had left from the dinner. It’s so helpful to the families staying there. Thank you so much for sharing. I am taking such wisdom from the stories you all are sharing. I love your comment about friends who could make you laugh. I really like the point about being a liaison. I find updating others repeatedly exhausting. And the cooler when dropping off food, pure inspiration! This would have come in handy for us. The only other thing I would add is to honor wishes for space. That when someone says that we just need quiet, to honor that, and please know you will have a chance to help at a later date. love this…this is my heart for sure..thank you for posting!